ViewsafeTM is the ultimate safety assured maintenance portal for electrical switchgear that integrates the most important safety and functionality features required when inspecting and maintaining live electrical equipment and switchgear. "Viewsafe is a truly unique and innovative product that I believe will revolutionize the way maintenance inspection is conducted in the future." FUNCTION: to allow the thermal inspection of equipment, integrating ViewsafeTM with Fluke IR Windows and most brand name thermal imagers gives users the safest and most efficient method of monitoring and maintaining their electrical equipment and assets. 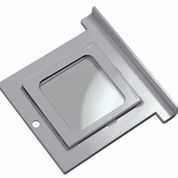 Reduce Cost - IR Windows become much more cost effective when utlizied within the ViewsafeTM system. 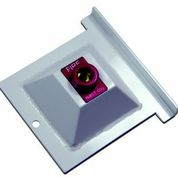 Due to its unique design, only a single ViewsafeTM IR Maintenance Slide is required per installation, as each individual slide will fit the low costing ViewsafeTM Base Unit. 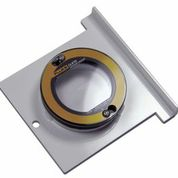 This reduces overall cost as well as providing the user with a much more efficient means of preventive maintenance. Prevent Downtime - Regular live inspection of electrical equipment provides the user a far higher accuracy of information on eqiupment performance. In contrast to the standard annual inspection, with the purchase of a Spectrum ThermoTRACK-IR AT Series Thermal Image Camera and the ViewsafeTM sysem, the user is able to inspect far more more frequently - vastly reducing the risk of electrical failure, and therefore unplanned downtime and costs. FUNCTION: the integral UltraTEV Plus+TM sensor allows our Partial Discharge Slide to detect partial discharge via TEV and ultrasonic measurement techniques to provide the user with the optimum information on the health of their electrical equipment. Performance - Safety regulations mean that at present on-line ultrasonic detection must take place outside of the electrical cabinet. This leads to distorted readings caused by ambient noise interference in the surroundng area; thus potentially resulting in the unsuccessful detection of faults. ViewsafeTM provides the perfect solution to this problem with the Partial Discharge Slide. Ergonomic Design - The lightweight, ergonomically designed hand set features a menu-driven, backlit colour LCD screen that provides a range of information, including numerical values of TEV and ultrsonic readings. This allows the operator to compare readings between assests as well as compare single asset readings over time. The UltraTEV PlusTM also includes a headphone socket for audible readings of ultrasonic activity to enable operators to hear PD activity directly as they undertake their asset condition surveys. 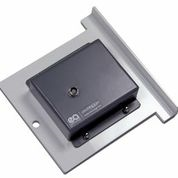 FUNCTION: the Observational Maintenance Slide provides users of ViewsafeTM with an enlarged viewing port to visually inspect electrical equipmenet and components inside a panel safely and efficiently. Safety - the use of ViewsafeTM also removes the need for an electrical panel to be islated when a visual inspection is required, avoiding both downtime and unnecessary cost. Trend Condition - when used with our Testoterm temperature trips, the Observational Maintenance Slide can be used to periodically monitor the rise in temperature within the electrical equipment. The non-conductive Testoterm temperature strip permanently changes colour as the equipment temperature rises. Intermitent rises in temperature are also flagged since the temperature strip does not go back to its normal state after being exposed to higher temperatures. FUNCTION: In the worst-case scenario where an electrical fire ensues from an equipment failure, the task of extinguishing the fire before substantial damage and potential injuries have occurred is a pressing one. It is for this reason that the ViewsafeTM CO2 Emergerncy Maintenance Slide was developed. 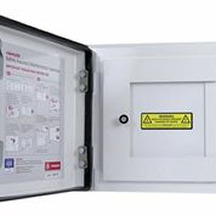 Immediate CO2 Access - no longer is there the requirement to isolate the panel - eradicating the opportunity for the fire to escalate into something more serious. The unique ViewsafeTM design ensures that no further oxygen can enter the panel once the CO2 Emergency Maintenance Slide is put into place. Thus if an electrical fire has occurred, it does not intensify and remains contained with the electrical cabinet.